You play a young girl who is about to marry the Prince, when an evil Witch materializes and kidnaps the Queen, sends the Prince into a 100 year sleep and then transmogrifies our heroine into a Slug. Your task is to find a fabled Gem and return it to the King so as to pay the Queen's ransom. This game is also included as a sub-adventure-game in 'Crave'. It was supposed to be just a couple of screens and one puzzle. However, as things do, it grew and grew into a complete little adventure that stands up on it's own. For that reason I'm releasing it on it's own, and also for anyone who, for whatever reasons, don't wish to find it in 'Crave'. The game is written in the style of mid 1980's early graphic adventures, and deliberately has some of the pitfalls games of that era were prone to. Where's M' Hat Ma ? 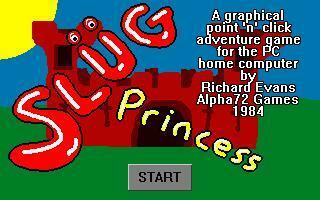 Well, I very much disagree with the 1 cup rating on Slug Princess. It's fun, it isn't easy and it's a darned sight better than the great majority of short games here. Frankly, I don't think Wretched could write a game that isn't entertaining.